Miscellaneous collection of media and other material featuring or quoting McIntosh. Copyright remains with original author/creator of each document. 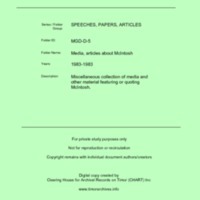 “Media, articles about McIntosh [MGD D5],” CHART DIGITAL, accessed April 18, 2019, http://chart-digital.info/items/show/651.